Mandatory Islamic veil affected how I see myself as a woman. It alienated me from myself. I hope a day arrives when no girl, no woman, is forced to wear the mandatory veil against her will and without the ability to decide. I hope for a day when no one can yell at any little girl or woman to fix her veil, to cover herself, and to be ashamed of a strand of hair showing from underneath her scarf. 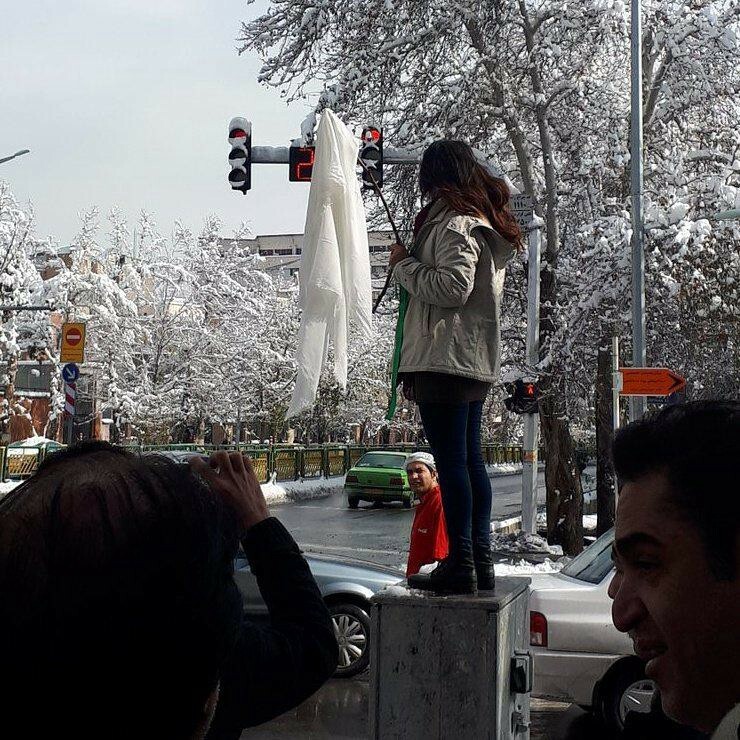 I wrote the piece below, thinking about the courageous young women standing up against mandatory veil in today’s Iran. She was standing in the bathroom for a couple of hours straightening her long hair and getting ready for her first ever high school dance. She was nervous. What if she would end up that one ugly girl at the dance with no boy wanting to dance with her? What if she was left completely alone the whole evening? Lost in her thoughts, she suddenly caught herself in front of the mirror in the bathroom. She was really becoming a woman. She touched her lips. They felt different than ever before. She didn’t look like a child anymore. She looked at herself in the mirror, and barely recognized herself and her body. She now had the body of a woman. She was half scared and half excited that she was finally growing up. Her classmates in her new high school had instructed her to wear something tight. They had told her that boys here in the United States would pay attention to you as a girl and would want to dance with you if you wore tight clothes to show your “curves”. She hadn’t quite understood what curves really meant. Nevertheless, she had bought herself some tight clothes with the help of a beautiful Venezuelan friend. They both barely spoke English, but managed to communicate just fine. She wore her new pair of tight jeans and a dark tight top. She put her now super straight hair down and put on her new silver heels. She could barely stand with the really high heels on. But, that was how it was to be a beautiful girl, she thought. She simply had to get used to the pain that went along with putting a thick nail under your shoe. She lousily put on some makeup. Her friend had told her that here in the United States lipsticks were not in fashion for high school girls, and so she was now wearing sparkling lip-gloss like most American teenage girls in her school. She was ready to go. She was a bit shy to leave the bathroom and confront her mom like this. She took a close look at herself winking in the mirror and smiling, trying to decide one last time if she looked beautiful. Technically she was ready. But, something was missing. What was it? She couldn’t quite tell. She turned around in front of the mirror, checked out herself from all possible angles. Something was missing. She suddenly felt excruciating pain in her eyes, as big and heavy drops of tears began to roll down from her eyes spreading her black eyeliner on her face. She missed home. She missed Tehran. She even missed that goddamn manto roosari (mandatory Islamic robe and veil). She couldn’t recognize herself without it. How could she miss something she used to hate? Wiping off her tears, she took off her heels, and tiptoed her way out of the bathroom so that her mom wouldn’t see that she was crying. She secretly went to her small closet, found the dark blue scarf with which she had left Iran forever only a few months before, hid it under her top and quickly went back to the bathroom. “Azadeh?” Her mom said. “You are running late for your dance, dokhtaram [my daughter]”. Why aren’t you leaving? Go have some fun with your new friends!” She continued. “Coming!” She said nervously. She locked the door behind her, and did what she never thought she would. She put on her scarf and looked at herself in the mirror. She saw a swan, a beautiful swan. “Wow!” She thought to herself. “I recognize you now. You now look like yourself, except prettier with that shiny lip-gloss on.” She told herself wiping off more of her tears. Then she took a few strands of her now straight hair out, refreshed her lip-gloss and winked at the mirror. She could easily recognize this girl that was loosely veiled. It was like someone had poured cool water on all her wounds and worries. She felt alive again. She felt beautiful and now had the courage to attend her first ever dance in an American high school. She took off the scarf, folded it, kissed it, hid it under her top, put it back in the closet, wore her heels and went to her mom. “Look at my beautiful daughter! You have grown up so much. I wish your father were here to see. Go and have fun, dokhtaram!” She said. She walked towards her mom funnily with her heels on, gave her a big hug and said, “I am always going to be your little girl!” She felt guilty that she was not telling her mom what she had done in that bathroom. She was puzzled by her own action. Her mom had sacrificed so much to bring her to the US so that no one can force her to wear the Islamic veil or not to speak her mind, and so that she could enjoy freedom. She didn’t like the manto roosari that she was forced to wear already for a few years. But, she didn’t feel beautiful without the veil anymore. How could she ever tell this to her mom? She never would. She worried it would break her heart. She went back to the closet, secretly tucked the dark blue scarf into her purse, kissed her mom and walked out of the apartment where America would begin.